Pegasus is a new luxurious complex. 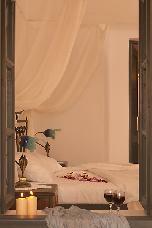 It consists of studios, apartments and suites decorated and furnished in the traditional Cycladic way. In it you will admire old antiques too. It is located in Imerovigli next to St Nikolaos Byzantine monastery. Snug into the cliff of the Imerovigli, overlooking the Pelagos and the old crater of the volcano. Santorini, the well-known Cycladic island, has many places you can visit and admire the unique landscape and famous sunset, but at Pegasus the altitude is 330 meters and gives a direct view to the volcano, the Aegean and the amazing Santorinean sunset. Here at Imerovigli (the highest spot of the rim of the Caldera) the greatest view is offered. 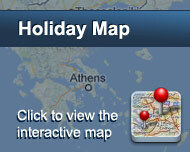 Pegasus is only 1 km away from Fira, the island's capital and 7 km from the airport and 9 km from Athinios port. 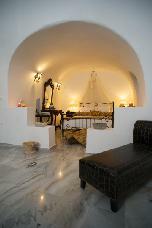 Architecture: Aegean Cycladic Conteporary arcitecture in the style of the island with period and antique furniture. Guest Services: Front and coordination desk with bell boy service. 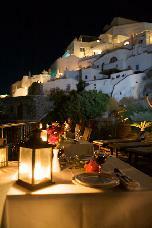 Location: New, Elegant, Luxurious and superbly situated Suites, barely 1000 m.from the capital of Santorini island - Fira. Είστε ιδιοκτήτης ή διευθυντής στο PEGASUS SUITES; Εγγραφείτε τώρα για δωρεάν εργαλεία, που μπορείτε να χρησιμοποιήσετε για να βελτιώσετε την καταχώρησή σας και να συνδέσετε την ιστοσελίδα σας και το σύστημα κρατήσεών σας.